Tre Mason set SEC Championship Game records with 46 carries for 303 yards and 4 TD. When the 2013 football season started, no one would have imagined that the Auburn Tigers and the Missouri Tigers would be playing for an SEC title. In 2012, Missouri had a 2-6 conference record and Auburn failed to win a single conference game. In the preseason polls, Auburn was picked to finish 6th in the SEC East and Missouri was picked 5th in the SEC West. No one could have predicted that both teams would be 11-1 or that Auburn would be #3 in the country and Missouri would be #5 in the country. Missouri coach Gary Pinkel has done a good job turning his program around this year. For the most part they have been healthier than in 2012. Quarterback James Franklin only played in 9 games in 2012 and 2013, but this year freshman Maty Mauk filled in for Franklin and did a very good job. The Missouri receiving corps has really stepped up this year and sophomore Dorial Green-Beckham may have made the biggest strides. Green-Beckham was the top rated high school receiver in the 2012 recruiting class, but he spent most of his freshman year figuring things out. This year, his confidence has skyrocketed and he has learned to use his size and athleticism to dominate and lead his team in receptions. The Missouri receivers have good size and they use their size to create mismatches against smaller defensive backs. First year head coach Gus Malzahn and first year quarterback Nick Marshall have the Auburn offense clicking on all cylinders. Marshall seems to improve every game and is maturing as a quarterback. It makes you wonder if anyone can stop the Auburn offense. Marshall now has full command of the offense and I wouldn’t want to be the defensive coordinator trying to figure out how to stop it. Missouri cracked the scoreboard first. Missouri defensive end Kony Ealy sacked Marshall, giving Missouri the ball at the Auburn 43 yard line. After getting one first down, the drive stalled and Missouri had to settle for a 42 yard field goal to take a 3-0 lead. Auburn responded quickly with a 38 yard TD pass from Marshall to sophomore receiver Sammie Coates to go in front 7-3. Missouri stormed back on their next possession. Using the passing of Franklin to Green-Beckham and L’Damian Washington, they moved the ball into Auburn territory. Franklin then hit Green-Beckham from 28 yards out to put his team back on top 10-7. On Auburn’s next possession, Marshall completed a 54 yard pass to Coates to give his team the ball at the Missouri 21 yard line. From there, running back Tre Mason got the ball to the 9 yard line and then Marshall scored from there to make the score 14-10. On the kickoff, Auburn tried an onside kick and recovered the ball, but could not capitalize. They were forced to attempt a 54 yard field goal and missed the kick. After the missed field goal, Missouri used their running game to move the ball to the Auburn 25 yard line, but Auburn got the first turnover of the game. Franklin was intercepted by junior safety Jermaine Whitehead at the Auburn 9 yard line. Missouri responded by creating a turnover their own. Ealy stripped the ball from Marshall on a running play and Missouri corner E.J. Gaines scooped up the ball and ran 11 yards into the end zone. The play put Missouri back on top 17-14. On Auburn’s next possession they drove 75 yards on 8 plays using mostly the running game. On 1st and goal from the Missouri 7 yard line, Mason scored his first touchdown of the day to put his team back on top 21-17. On Missouri’s next possession, they used the arm and legs of Franklin to move the ball to the Auburn 17, but the drive stalled and they settled for a 36 yard field goal to cut the Auburn lead to 21-20. 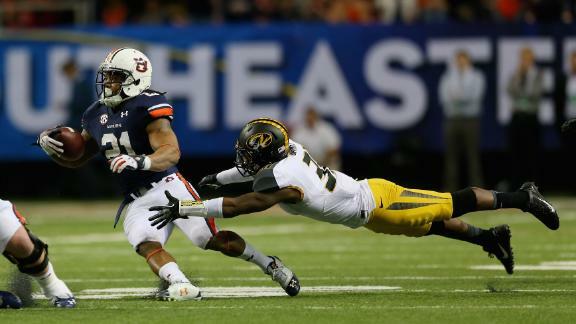 On the first play of Auburn’s next possession, Mason raced 52 yards to give them the ball at Missouri’s 27 yard line. Three plays later, Mason scored from 3 yards out to extend the Auburn lead to 28-20. On Missouri’s last possession of the 1st half, Franklin hit Green-Beckham for a 55 yard score to bring his team within 1 point at 28-27. On Auburn’s second possession of the 3rd quarter, they got good field position after a Chris Davis punt return. They were unable to get it into the end zone, settling for a 52 yard field goal to extend their lead to 31-27. Missouri responded with a touchdown drive. Franklin passed his team downfield and connected with running back Marcus Murphy from 10 yards out and Missouri was back on top 34-31. Auburn came right back, going 75 yards in in 6 plays. Marshall had a 42 yard run to put the ball at the Missouri 2 yard line. Junior running back Corey Grant put the ball into the end zone to give his team a 38-34 lead. After forcing a Missouri punt, Auburn struck again. Junior running back Cameron Artis-Payne scored from 15 yards out to extend Auburn’s lead to 45-34. Just when it looked like Auburn had the game in hand, Missouri running back Henry Josey ripped off a 65 yard run. A personal foul, put the ball at the Missouri 5 yard line. From there, Franklin ran it into the end zone. Franklin also scored on a 2 point conversion to cut the lead to 45-42. As the 4th quarter started, Grant had a 43 yard run to set up his team at the Missouri 32 yard line. Mason eventually scored from 1 yard out to extend Auburn’s lead to 52-42. After trading punts, Missouri was pinned deep on their own 4 yard line with 6:13 left. They eventually turned the ball over on downs after going for it on 4th and 1 at their own 13 yard line. On the next play, Mason scored his 4th touchdown of the day to put the game out of reach at 59-42. Missouri had one more possession and again turned the ball over on downs with 1:46. Auburn ran the ball with Tre Mason 2 more times to put him over 300 yards rushing for the day and close out the game. This was a very entertaining game. Both teams went after each other, answering each score with a score of their own. Auburn has a red hot team. They dominated the Missouri defense with 545 rushing yards and SEC Championship Game record 677 total yards. Tre Mason set SEC Championship games with a school record 46 carries, 304 yards, 312 scrimmage yards, 312 all-purpose yards and 4 touchdowns. He had an amazing game and put himself into contention for the Heisman Trophy, although I believe Jameis Winston will win that award. The win, coupled with the Ohio State loss in the Big Ten Championship game has vaulted the Tigers into the BCS Championship Game against Florida State. I said last week that this may be a team of destiny. They have their chance to grab the brass ring, we’ll see if they can make their dreams come true. Missouri also had a good game offensively. They had 303 passing yards and 231 rushing yards, they just could not stop the Auburn running game. At times Missouri went with a 3 man line and when Auburn saw that, they just ran the ball outside of them. It has to be frustrating to score 42 points and still be outscored by 17 points. Nick Marshall, QB, Jr: Magician running the option. Ability to give an option look and then throw the ball at the last possible second. Defenders can’t tell if he is going to run or throw. Very elusive. Makes people miss in the open field. Throws a nice deep ball. Completed 9/11 for 132 yards, 1 TD. 16 carries for 101 yards and 1 TD. Had a 42 yard run. Lost 2 fumbles. Tre Mason, RB, Jr: Had an amazing game! Set multiple SEC Championship Game records. Workhorse. Great leg drive. Carries defenders with him. Nimble in traffic. Uses stutter step to change speed. Slippery. Has been invited to New York for the Heisman Trophy ceremony. Had 46 carries for 304 yards and 4 TD, one of them on 4th and 1. Had 1 catch for 8 yards. Cameron Artis-Payne, RB, Jr: Tough between the tackles. Lowers shoulder and takes on defenders. Good moves. Had 2 carries for 36 yards and 1 TD. Corey Grant, RB, Jr: Very fast. Good vision. Excels on outside run plays. Able to return kicks. Had 5 carries for 65 yards and 1 TD. Had a 43 yard run. Trayvon Reed, WR, Jr: Good hands. Had 1 catch for 23 yards. Chad Slade, G, Jr: Good mobility. Good at pulling and trapping defenders. Reese Dismukes, C, Jr: Strong and dominant at the point of attack. Veteran that anchors the offensive line. Able to get to the second level and block linebackers. Key to the inside run game. Dee Ford, DE, Sr: Good power move. Good outside containment. Good speed. Had 3 tackles, ½ tackle for loss, ½ sack, 1 QB hurry. Chris Davis, CB, Sr: Aggressive. Plays tight man coverage. Good instincts. Jumps routes. Very good vertical jump. Not afraid to deliver a blow. Had 4 tackles and 2 pass breakups, one of them on 4th down. Averaged 18 yards per punt return. Ryan White, S, Sr: Beat on a 55 yard TD (second long TD given up in two weeks). Had 4 tackles and 1 QB hurry. Jermaine Whitehead, S, Jr: Does a good job defending the option. Had 6 tackles and 1 pass breakup. Had an interception in the red zone. Robenson Therezie, S, Jr: Competes for the ball. Good special teamer. Had 1 tackle and 1 pass breakup in the end zone. Downed a punt at the 4 yard line. Called for a personal foul penalty. James Franklin, QB, Sr: Dual threat. Key to the offense. Very good on QB draw. Runs with power. When he’s in the shotgun, he has a tendency to stand flat footed instead of being up on his toes. Eludes the pass rush and throws well on the run. Completed 21/37 for 303 yards, 3 TD and 1 INT. Had 15 carries for 62 yards 1 TD. Converted a 4th and 1 on a run. Had a run for a 2 point conversion. Henry Josey, RB, Jr: Recovered well from gruesome knee injury in 2012. Explosive. Very good feet. Sets up blocks and finds creases. Very good cutbacks. Had 9 carries for 123 yards. Had a 65 yard run. Was shoved into a cart on the sidelines and hurt his back. Marcus Murphy, RB, Jr: Versatile, able to contribute as a runner, receiver or kick returner. Slips tackles in the open field. Had 5 carries for 65 yards and 1 TD. Had a 43 yard run. Marcus Lucas, WR, Sr: Good size (6-5, 220). Has speed to get deep. Had 5 catches for 50 yards Had a 43 yard catch. Bud Sasser, WR, Jr: Great hands. Good ability to adjust to a bad pass. Had 3 catches for 34 yards. Mitch Morse, OT, Jr: Good run blocker. Threw key block on a 65 yard run. Called for a false start penalty. Kony Ealy, DE, Jr: Had the best game of any Missouri defender. Good at pressuring the QB. Great speed rush. Versatile. Able to move inside on passing downs or drop into coverage. Had 5 tackles, 3 tackles for loss, 1 sack and 2 forced fumbles. Michael Sam, DE, Sr: Leads the SEC in sacks with 10 ½ and tackles for loss with 18. Had a quiet game with only 3 tackles. E.J. Gaines, CB, Sr: Leads the team and #4 in the SEC with 4 interceptions. Good man cover corner. Tackles well in space. Willing to make the tackle. Had 9 tackles, 1 tackle for loss and returned a fumble for a touchdown. Called for a personal foul penalty. This entry was posted on December 11, 2013 by draftmaniacs in Scouting reports and tagged 2014 NFL draft, Auburn Tigers, Missouri Tigers, NFL, NFL Draft, Tre Mason.